"Obadiah," he said, "something must be done before all the animals die. We must find grass and water. You go in one direction and I'll go the other. There must be grass somewhere." 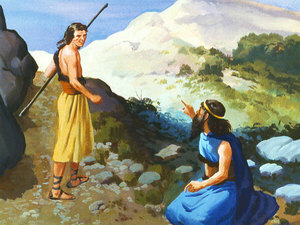 While Obadiah was looking here and there, trying to find mud puddles and grass, he saw a man walking toward him. "I wonder who that could be," he thought to himself. 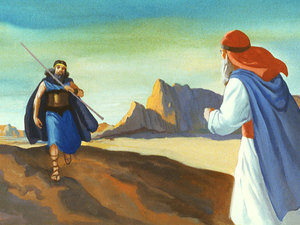 As the man came closer, Obadiah recognized him. "Why, that's Elijah!" he exclaimed out loud and ran to meet him. "Elijah! Elijah! Is that really YOU?" he asked excitedly. "Yes, I am Elijah, and I want you to do me a big favor." "What is it, sir?" Obadiah asked politely. 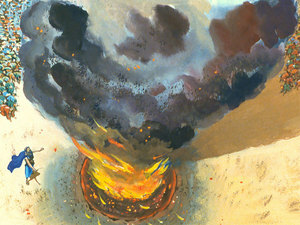 "I want you to go tell King Ahab that I am here and want to see him," Elijah explained. Obadiah instantly became fearful. This was NOT something he wanted to do. "How can you even think of asking me to do such a thing?" Obadiah asked with astonishment. "Don't you know that King Ahab HATES you? 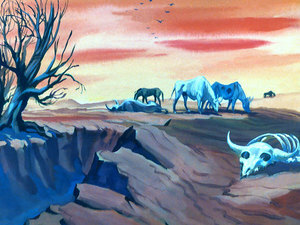 Don't you know that the King is blaming YOU because there has not been any rain for all these years? Besides that, the King has been looking for you. Every time he thinks he knows where you are, you leave and no one can find you. If I tell him you are here, then you will leave again; he will want to kill YOU and ME. I'm sorry, Elijah. I just cannot do it!" 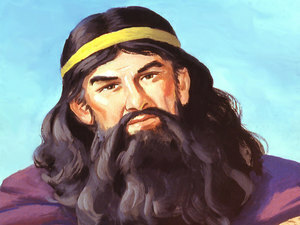 Elijah looked at Obadiah and patiently explained, "It will be fine, Obadiah. I promise you that I will be here. I promise you that I WILL see the King. Now please, just go and tell him I wish to speak to him." "YOU! YOU! YOU are the one that is causing trouble for Israel!" 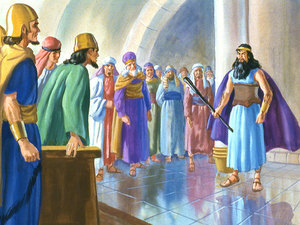 King Ahab shouted in anger. "YOU are the reason we have had no rain!" "No, King," Elijah replied. "YOU are the cause for all this trouble. You have turned away from Jehovah, the one true God. You are worshipping the false god, Baal. You have caused the people of Israel to sin by worshipping idols. YOU have brought all this trouble to Israel." Elijah continued his speech. "I want you to gather 450 prophets of Baal, and 400 prophets of of Ashtoreth, and have them meet me at Mount Carmel." 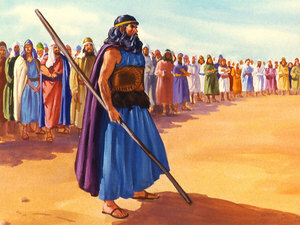 Elijah stood before the crowd. "How long are you going to try to worship Baal and Jehovah? You cannot serve more than one god. If Baal is God, worship him! If Jehovah is God, worship Him! You MUST make a decision. You must choose one or the other." Then Elijah said, "We are going to have a contest to see who is the REAL God." 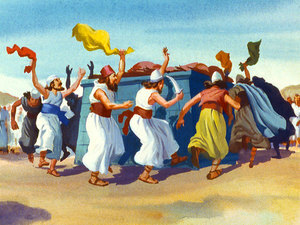 He told them to bring enough wood to build two altars — one for Jehovah, and one for Baal. He told them to bring animals for the sacrifice — one for Jehovah and one for Baal. The 450 prophets of Baal built their altar. They prepared the animal for the sacrifice. Then they started praying: "O Baal, hear us! O Baal, hear us!" From morning until noon they kept up the shouting. Elijah was taunting and making fun of them: "What's wrong? Can't your god HEAR you? Has he taken a trip? Why isn't he answering you? Perhaps he is talking to someone else. Maybe you should scream LOUDER." He told them to bring him four more barrels of water. "What's wrong with this guy? Doesn't he know there is a shortage of water?" they were mumbling among themselves. But they obediently brought the water. 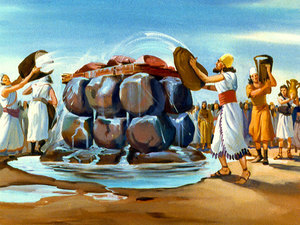 He poured the water on the altar and on the sacrifice. That wasn't enough for Elijah. He told them to bring him FOUR MORE barrels of water. "How much water is he going to waste?" someone whispered. Again they did as they were told and brought the water. He poured that water on the altar and on the sacrifice. The sacrifice was soaked with water. Water was running off the wood, onto the stones, and onto the ground. He dug a ditch around the altar and filled it with water also. "Lord God, let the people know that You are the true God of Israel and I am your servant. Let them know that I have done these things because You told me to do them. Hear me, O Lord, so these people will know that You are the Lord God, and they will serve You again." When the people saw it, they dropped to the ground in fear and cried out, "The Lord, He is the God; THE LORD, HE IS THE GOD!" Then Elijah turned to King Ahab and said, "Get up! Eat and drink! There will be an abundance of rain!" So King Ahab had something to eat and drink, and Elijah took his servant with him to the top of Mount Carmel to pray to God and wait for the rain. 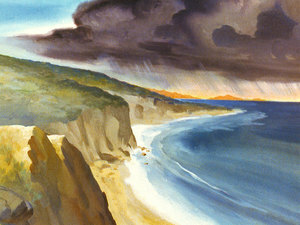 "Look toward the sea and tell me if you see rain," Elijah said to his servant. The servant peered into the distance but didn't see any rain. "Look again," Elijah told him. He looked again, but still there was no rain. ...and asked the servant to look again. This time the servant saw a little cloud way out in the distance over the sea. "Run quickly!" 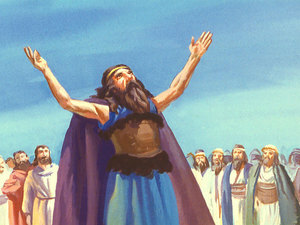 Elijah commanded. "Go tell King Ahab to get his chariot ready and get off the mountain before the rain starts." How long did the drought last? Why was there no rain for such a long time? How many prophets of God were in the contest? 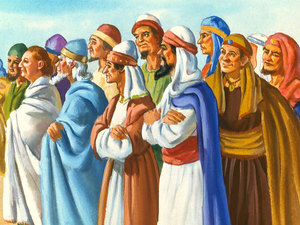 How many prophets of Baal? ". . . choose you this day whom ye will serve . . ." (Joshua 24:15). want to serve You with all my heart.